Chances are that when you purchased your home, the tile and grout were not sealed. Even when you have it installed as a remodel, there is a step that is often skipped. It just happens to be one of the most important steps. 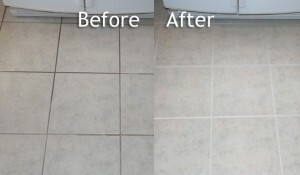 If your grout appears to get darker when it is wet, its a good indication that it lacks sealer. 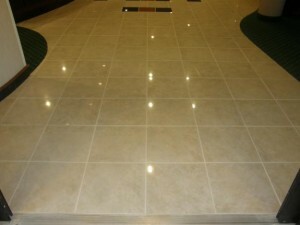 Without sealer, your tile and grout absorbs whatever is applied by accident or not. Dirty mop water, cooking oils, spills, and pet accidents will quickly change the color of your tile and grout. Our tile and grout restoration takes care of most hard floor coverings, natural stones, back splashes, and tiled showers. With our high heat and aggressive floor tools, we will change the appearance of your tile and grout immediately. 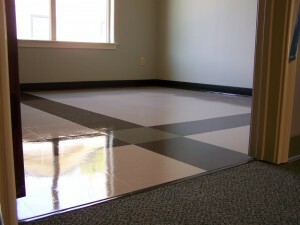 After cleaning, a sealer is applied to help you maintain your floors bright and clean appearance. When a job is complete, you will receive after cleaning care instructions to refer to when you have questions concerning a tile and grout. Just like carpet, your tile and grout require professional care to effectively restore and extend its beauty. Grout is a porous material that quickly collects and embeds dirt, spills, and other mishaps that come from living in your home. You can scrub on your hands and knees and still not achieve the clean we will have in minutes. Contact us right now for a free estimate.